Wm. 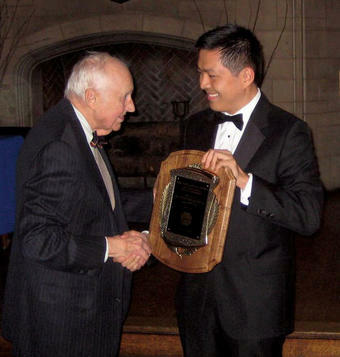 Theodore de Bary ’41, ’53 GSAS was awarded the Philolexian Award for Distinguished Literary Achievement at the Philolexian Society’s annual dinner, held at the Union Theological Seminary on April 17. De Bary, the John Mitchell Mason Professor Emeritus and Provost Emeritus of the University, was cited as “a distinguished member of the Philolexian Society and a giant in the field of literary endeavor who is the quintessential great teacher, the quintessential great scholar and the quintessential great Columbian.” Tao Tan ’07, ’11 Business, a former student of de Bary’s, presented the award.